Since the launch of the "Rise of Central China" strategy, Wuhan has become increasingly involved in a number of national strategies. Wuhan has been selected to become an Independent Innovation Demonstration Zone, as an important part of the Yangtze River Economic Belt and a key city in the Middle Reaches of the Yangtze River City Cluster. It has been chosen to become a comprehensive innovation and reform pilot city. In April of 2015, the development plan for the Middle Reaches of the Yangtze River City Cluster was approved for implementation by the State Council. The Cooperative Secretariat for the program opened in June in Wuhan. "Wuhan's influence is expanding beyond Hubei, and Wuhan is accelerating development along the Yangtze River Economic Belt. The project will align with the Beijing-Tianjin-Hebei, Yangtze River Delta, and Pearl River Delta economic zones," said Wu Chuanqing, the director of the Regional Center for Economic Research at Wuhan University. Six years ago, Wuhan's total economic output was RMB 551.576 billion. The 12th Five Year Plan encouraged Wuhan to realize a total economic output of over RMB one trillion. By the end of 2014, one year ahead of schedule, Wuhan's total economic output exceeded its goal, resulting in the elevated rank of the eighth highest in China. Of the nine Chinese cities with total economic outputs greater than RMB one trillion that year, Wuhan was the only one in Central China. In September of last year, Wuhan launched a plan to double its total economic output and surpass RMB two trillion by 2021. Last November, the standing committee of the Wuhan Municipal Committee of the CPC submitted a draft of the Plan for the Systematic Promotion of Innovation and Reform and Accelerated Construction of an Innovative Industrial Center with Global Influence. Building an innovative industrial center with global influence requires a global vision. It requires centralizing national economic activity and resources, creating a national transportation hub, establishing strong national information networks, setting up major national science, education, culture, and innovation centers, and ensuring that this city is globally influential and has what it takes to be competitive. Building an innovative industrial center with global influence also requires world-class leaders and talents. 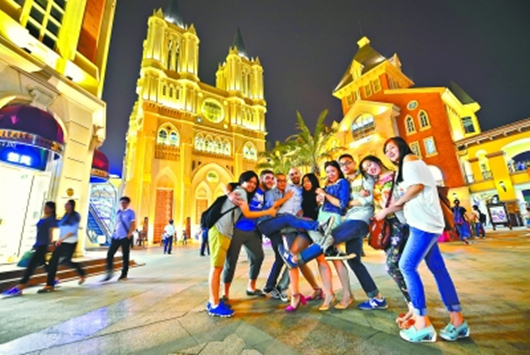 Wuhan recently launched the City Partners project and began inviting talents from across China and around the world to Wuhan to offer their wisdom. This city's glorious history has brought it to this moment, and will continue to inspire Wuhan to achieve bigger, better, and greater things.